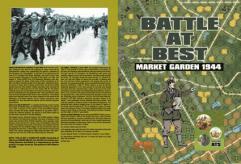 On 17 September the 502nd Parachute Infantry Regiment jumped over drop zone B in Son, the Netherlands, as a part of Operation Market Garden. The 502nd PIR is one of four rifle regiments of the 101st Airborne Division. Their assignment was: Secure the drop- and landing zones for the glider landings, attack Sint-Oedenrode to seize and hold the bridges over the Dommel River and seize and hold the bridge at Best over the Wilhelmina Canal. The 502nd PIR would never had guessed that German resistance at Best would be so intense. The reason for the German strength in Best, was caused by the retreat of German forces coming in from the west of the Netherlands. The 15th German army was retreating from the Scheldt estuary, accompanied by many small groups of battered divisions coming from Normandy. When operation Market Garden started, a lot of these troops were located in between Boxtel and Hertogenbosch. Although most German divisions were decimated in Normandy, the German brass organized the defense of the corridor quickly. They formed small fighting groups (Kampfgruppe) and sent them into action immediately. At the time Company H made its way for Best on the 17th, a fighting force of about 1000 German soldiers were already in Best. Later during that day, more enemy reinforcements were sent to Best, including the 59th and 245th Division and two SS police battalions. Includes at a brand new historical map, at least 8 new scenarios, all the combat counters needed to play and a color folio. You will need to own the ATS Rulebook and standard system markers - plus one or more 10-sided dice (2 or more suggested).